These magnetic patriotic ribbon things, I think people have just started to realize that they're magnets, because I've recently heard that they're getting stollen off vehicles. It's just too easy. But it made me think up a silly idea, which has already sort of been done. 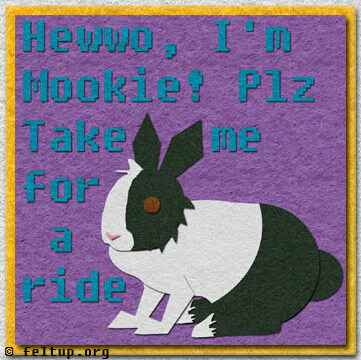 I'd like to get some printed magnets some how, put something eye catching on them (like my dear sweet lovable Mook) and encourage they be stolen. Sort of like that "Where's Bill?" thing I've seen on some dollars. It obviously would need some fine print (which felt cannot provide). I'd need like.. a website for people who have stolen the Mook-magnets to say where they have kidnapped her too, and track her across the country.